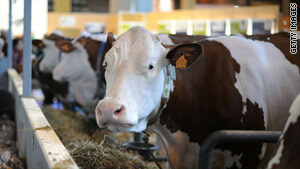 Does the mega-dairy plan sour the debate over farming practices? (CNN) -- The plan for Britain's first "factory farm" for cows has stirred up the debate on the future of farming in Europe. Similar "feedlot" dairies are commonplace in the U.S., but plans for a complex housing up to 8,100 cows in England is the first proposal on such a large scale in Western Europe. It is still far from clear whether they will be accepted on a continent increasingly obsessed with where its food comes from. There's a certain irony in the timing: Nocton Dairies has submitted its application to open the huge industrial dairy just as the anti-industrial farming movie "Food Inc." opens in cinemas across the UK. The plans have sparked fierce protests from an unlikely alliance of campaigners that includes dairy farmers and animal rights activists, with everything from concern about damage to local archaeology, pollution and animal welfare being put forward as objections. "Anyone with any concern for animals or the countryside should be against this," Justin Kerswell, from Vegetarians International Voice for Animals (Viva!) told CNN. "It's a massive step backwards just as consumers are becoming more and more aware of where their food comes from. "Although we are against dairy full stop we are realistic enough to know that we need to focus on improving the system." The dairy industry has suffered from under-investment; hopefully this will go towards reversing that trend. If the £40 million development near Lincoln goes ahead the cows will be kept on constantly cleaned and recycled sand, fed a mix of lucerne and maize and milked in two 24-hour parlors. "If you listen to Nocton they make it sound like it is a Five Star hotel for cows," says Kerswell. "They say the animals are free to roam, but that's only from wall to wall. There will be more lameness and disease; it's inevitable. "Theoretically, an outbreak of Foot and Mouth would mean having to kill every single animal. You've only got to look at the link between swine flu and intensive pig farming to know how wrong this all is. "If this goes ahead, more sites like it will follow and it could be the beginning of the end for traditional dairy farming in the UK... It's a disaster all round." Although Nocton Dairies did not reply to CNN's request for an interview, they did make a statement: "The dairy has been designed to a level beyond the highest environmental and animal welfare standards ever seen in the UK. "For example, the cows will be bedded on deep sand to ensure unparalleled levels of hygiene and comfort... We are hoping to develop technology to dry the bedding using surplus heat captured during the recycling process. All of the cows will have access to grazing." Nocton also claim the dairy will provide 85 jobs as well as opportunities for local contractors. It's a massive step backwards just as consumers are becoming more aware of where their food comes from. Robert Howard, a farmer involved with the proposed dairy, said in the statement: "This is great news for local farmers as it provides another nearby outlet for our produce and the opportunity to grow a broader range of crops. "The British dairy industry has suffered from under-investment in recent years; hopefully this will go someway towards reversing that trend. "Nothing this ambitious has been attempted in Western Europe -- let alone this part of Lincolnshire. It provides all of the neighboring farms with an opportunity to work together and represents a massive investment into the local economy". The Nocton proposals take place in the context of increasing uncertainty in the British countryside. Farming in the UK is under pressure from rising costs, falling revenues -- and the urgent need to become more ecologically friendly. Something has to change. But what's interesting is that the same forces are pushing farmers in opposite directions. While some, such as Nocton Dairies, are moving to a more intensive system, which benefits from economies of scale as well as the opportunity to control the environment more precisely, others are moving towards a much less intensive regime, and accepting its limits. "I can see there would be some seductive arguments in favor for the [Nocton] plans," Guy Watson, a pioneering organic farmer and founder of Riverford Organic Box Scheme, told CNN. "But I can see equally good arguments against this kind of system on the grounds of animal welfare, quality of milk and environmental impact. "If they get three lactations a day from cows kept in these conditions I'd be amazed, and they will inevitably have problems with fertility, lameness and mastitis. "The milk will also be discernibly different and it will have less fatty acids; that's always the way with a no-graze system... It should be sold as a separate product, when in fact it will probably just be labeled as 'local British milk' with a 'low carbon footprint'. "They may make all sorts of claims about being environmentally friendly, but the real environmental issue for dairy farming is that grass sequesters carbon. "If you feed cows on pasture, all the time the grass is sequestrating carbon. Whereas if you are feeding them on an annual crop like maize on a feedlot, you actually release carbon... Whether you plough the land or not is the biggest single environmental decision farmers face, it's massive." Environmental concerns will certainly be a key consideration when the Nocton application is considered by local planners -- and whether they accept the company's claims to be green remains to be seen. It's also unclear whether British consumers -- who rejected GM crops in the 1990s -- will buy the milk. A recent poll on The Daily Mail newspaper's web site suggested that 73 percent would refuse. Either way the stage is now set for a showdown that may have repercussions across Europe as the continent decides what path it takes towards farming in the future.